Angie Tibbs: Dr. Ezzat, let’s start at the beginning. In January 2011 hundreds of thousands of Egyptians began their Tahrir Square occupation; you were on the ground there as a journalist and as a medical doctor. Would you recreate the mood of the demonstrators, and, in fact, of the country? Ashraf Ezzat: Egyptians still refer to those 18 days (January 25- February 11) as the glorious days of the revolution. Those days will undoubtedly carve their place in the modern history of Egypt. And contrary to what the mainstream media concluded, the Tahrir Square saga that captured the world may have been called for by some activists using the internet social media, but it was mainly fueled and triggered by years of political corruption and oppression. The build-up for this uprising has been brewing for years and specifically after Mubarak made it clear he was bequeathing the presidency for his son, Gamal. Hence, the general mood of the Egyptians was a blend of dissatisfaction, anger and a potent urge for change. It is funny but it seems that the Egyptians had a clear-cut idea what they wanted from the first day they took to the streets. I joined the protests from the second day; the people on the streets were not divided about their demands. You could see it in their eyes and hear it as they chanted “Bread, freedom and social justice” … and those three demands are what the “Tahrir Square” is still fighting for. AT: One of the demands of the protesters was for President Mubarak to step down, effectively ending his 30 year authoritarian rule. This he did on February 11, at which time the military council took over the country, promising to bring about democracy and to respect the wishes of the people. Did this happen, and did anyone expect it would happen? AE: The military council of armed forces (SCAF), whose generals are Mubarak’s handpicked appointees, did nothing in the last ten months to promote democracy in the country; on the contrary, the generals, and through their ineptness or unwillingness actually to restore security on the street, have helped to bolster the tide of the counter-revolution. And hadn’t it been for the thousands who lately returned to Tahrir Square to denounce the military rule and ask for a hand-over of power to a civilian salvation government, the revolution would have been done with and declared dead. The majority of the Egyptian people kind of hoped the military would lead them out of these difficult times but while most of Egyptians didn’t doubt the capability of SCAF to do so, a lot of activists and political analysts suspected that the way SCAF has been handling things would eventually put the country on the road to democracy. AT: Are you saying that there were those who believed that in time the SCAF would have, if left in power, brought about democracy? AE: No, I meant to say that the downfall of Mubarak was so abrupt that nobody actually had seen it coming, not even the military which is part and parcel of the despotic old regime. And while stunned by the uprising’s rapid pace, military generals were following how this people vs. regime uprising was going to end, and they decided not to take sides until this whole thing was almost settled. But not everybody was fooled by this “wait and see” approach by the military. A lot of activists and political analysts knew that the self-serving generals would try to somehow steer this transitional period in their favor. And that is exactly what they did when they proposed a new draft for a constitution that would shield the military from parliamentary scrutiny and which declares the military the guardian of “constitutional legitimacy,” suggesting the armed forces could have the final word on major policies. AT: How did Egyptians feel about the military and the police from the commencement of the Mubarak regime up to the demonstrations of January 2011? AE: Actually Mubarak’s regime was just a police regime. A giant police apparatus that stifled dissent by violent means and that only served and protected the corrupt elite and the president. The citizen/police relation has been quite tense over years of coercion and misconduct. Throughout most of Mubarak’s rule Egyptians feared and somehow distrusted the police. But in the last couple of years and prior to his ouster they began to loathe the corruption that swept across the whole security apparatus that turned the policeman into a thug with a badge, placed him above the law and allowed him to get away with almost anything … even crimes. The famous case of the killing of Khalid Saeed, young Egyptian man from Alexandria, who was beaten to death by security forces after he was indicted on framed charges, has incited unprecedented anger and helped trigger the revolution in January. While the majority of Egyptians had negative feelings for the police they honored and respected the military for its patriotic role of protecting the sovereignty of the state and for the long and heroic confrontation with Israel especially after the 1973 war. But I hope that Egyptians will make the necessary and fair distinction between the military forces or the army as a whole and the generals in the military council when they come to judge the conduct of SCAF in the transitional period that followed January 25 revolution. AT: In the months since the occupation of Tahrir Square ended, have there been any changes meaningful to Egyptians? AE: Though a lot of things have remained the same if not for the worse, I would say that the only thing that really changed in the life of Egyptians is their ability to say NO to anything and anyone. And also to vote freely, as we all have witnessed the huge turnout for the first post-Mubarak parliamentary elections. The Egyptian people broke the fear barrier and this, for people who have been enduring under tyranny for centuries, is quite an achievement. Moreover, I truly believe that once placed on the path of real democracy, the whole world will witness a new and amazingly different Egypt. AT: Since the demonstrations ended in February, thousands of people have been arrested and tried before military tribunals, yet throughout the occupation of Tahrir Square there appeared to be good relations between the protesters and the security forces. What caused these widespread arrests and are they continuing? AE: As I mentioned before, many of the Tahrir activists viewed the stance of the military with suspicion and as days went by it became obvious that the generals were trying to give the old regime a comeback chance. The scenario of chaos and sectarian violence that Mubarak threatened would engulf the country if he was to step down was beginning to be unleashed. Shortly after the toppling of Mubarak, Egypt began to witness months of unrest, economic plunge, lack of security forces on the street, sectarian violence and a series of churches attacks which culminated in the lethal clashes with a Coptic rally on October 9 that left 27 killed by the military forces in what is now known as the Maspero massacre. But this was not what the revolutionary youths and activists demanded when they initiated the January uprising. This was not why people got killed in the protests. The people didn’t topple Mubarak to have a military dictatorship instead. So this is why the honeymoon with the military didn’t last and it wasn’t long before many activists began to point the finger at SCAF for all the scenarios aimed at thwarting the revolution tide. And it wasn’t long either before the thousands – almost 15,000 according to Human Rights Watch – were thrown behind bars and tried before military tribunals until this very day. AT: Protesters have again taken to the streets of Cairo and elsewhere in Egypt, and the police are responding, thus far killing over 30 people. What has prompted this, and what do you anticipate happening as a result? AE: According to the counter-revolution plan, which the United States fully backed, the military was supposed to grab the power permanently. To set the stage for such scenario, the military in the last ten months has done everything possible not only to thwart the advance of the revolution but to turn the Egyptians against the idea itself as the plan augmented the sense of vulnerability and insecurity of the average Egyptian citizen and cunningly linked it to the revolution. And just when the generals thought they had managed to hijack the revolution, they were in for a big surprise. Emboldened by the power they’ve got and by the American support, the generals dared to propose a new draft for a constitution that could only pave the way for a military fascism and this is where they went wrong. This blatant exploitation on part of the military council triggered the pouring of thousands into Tahrir Square once again in what is now dubbed “the second revolution”. AT: The military council is now promising presidential elections before July of 2012. Is this a satisfactory response to the current uprising? Will the Egyptian people accept this or will they view it as an attempt by the military to divert world attention from its ongoing crackdown? Furthermore, do Egyptians accept the military as a caretaker government? AE: Egyptians didn’t flock back to Tahrir Square to demand elections. The protesters in Tahrir Square have made it clear that they don’t want the military council as a caretaker and moreover they insist that the council should step aside and hand over power to a civilian salvation government. In January the protesters in Tahrir Square wanted Mubarak to step down, and in November they wanted the military to step aside. AT: Were you surprised to hear the US State Department initially praising the “exercise of self-restraint and professionalism” of the Egyptian security forces with respect to the present demonstrations? AE: There seems to be a growing number of people in and around the Tahrir Square angry at being fired on by weapons supplied from countries like the US, making nice noises about democracy and restraint in Egypt. The US government and its weapon companies continue to supply tools of repression, usually for profit, to those who they well know will use them to violate human rights and repress their own citizens. So once again the unexpected course of the Egyptian revolution – and contrary to the conspiracy theorists who view the Arab revolutions as orchestrated by the CIA & the neo-cons – has exposed the flagrant American double standards in the Middle East and especially in regard to the Arab spring. The mere fact that protesters refused to meet Mrs. Clinton, the American secretary of state, on her first visit to Cairo after the ouster of Mubarak should tell us how the revolutionary youths of Egypt view the United States’ stance on their revolution. AT: Do you see a connection between the Egyptian military and possible US and Israel future plans for Egypt? AE: I doubt the Egyptian military would undertake any move that could jeopardize its patriotic history, but I would certainly be relieved if this current top command of Egypt military could be replaced soon. No matter how we look at it, those generals of Egypt military council are part of the old regime. Indeed our reading into the current turmoil and change gripping Egypt and the rest of the Arab world is bound to open our eyes to a brand new Arab world in the making right now – but not the Condoleezza Rice’s new Middle East. New forces are emerging and the United States will soon have to relinquish its old diplomacy in Middle East that relied mainly on the so called strong allies/dictators and try to prepare for the rise of a new political front – most probably of Islamists – that will rule in Tunisia, Libya, and Cairo and maybe Syria. AT: What is happening in Egypt today, and what is the mood of the people? AE: The parliamentary polls opened amid escalating protests that reject the newly appointed prime minister and a build-up of public opinion that demands the generals must go back to their barracks. The general mood is split between the youths who seem determined to take the revolution to the farthest limit and the older generation who believe that stability and compromise is what the country needs right now. It is split between the conservative front who thinks it is time we gave our support for the Muslim Brotherhood (the longtime outlawed Islamist political group) and the liberal groups who, despite their modest preliminary showing in the parliamentary polls, believe that we should separate the mosque from the state. In that sense, you could say the current struggle is between the old and the new or the past and future; in other words, between the conservatives and the liberals. But I don’t think Egypt, the land of moderate Islam and the liberal hub of the Arab world, will get lost as long as the Tahrir Square spirit remains with us. 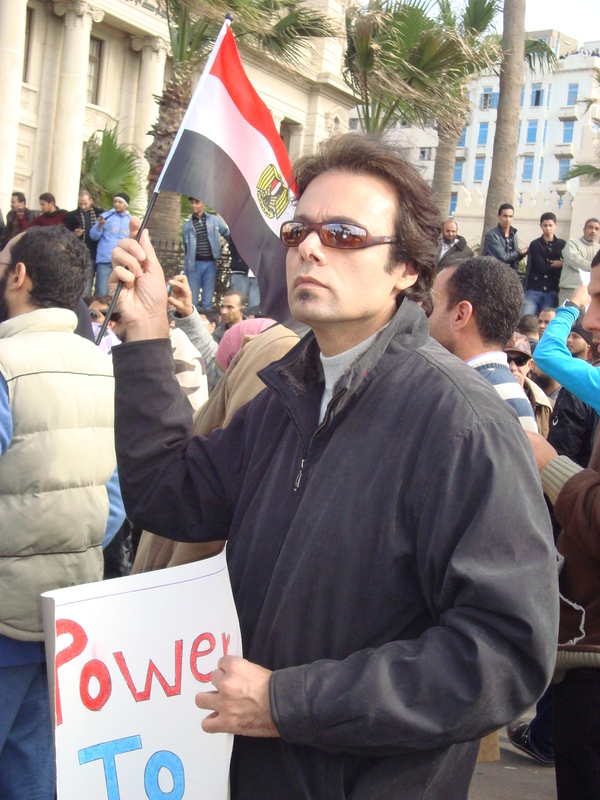 This article was posted on Monday, December 5th, 2011 at 8:01am and is filed under Egypt, Interview, Militarism, Police, Revolution, Solidarity.